EAST LIVERPOOL — Family members of Dillon Lockhart were in East Liverpool Municipal Court Thursday to show support for the 22-year-old Sprucevale Road man charged Wednesday after reportedly found trespassing inside a building on the former Riverview Florist property with potential weapons in his vehicle. Lockhart was charged with criminal trespassing and mishandling a firearm in a motor vehicle after city officials and police officers reported finding him holding a 14-inch knife and with a loaded .45-caliber pistol alongside the console of his vehicle, in which they also reported finding ammunition, spent shell casings, BB guns, knives, numerous bows and arrows and baseball bats that had been modified with sharp objects such as saw blades, barbed wire and bottle caps. Lockhart’s arrest and subsequent publicity on the city police department’s Facebook page and in the news media instigated a firestorm of controversy on social media, with supporters and detractors of both his actions and the police officers’ speaking out on both sides of the issue. Many of those commenting pointed to the similarity between Lockhart’s unusually- painted vehicle and the objects found inside to vehicles and weapons used on the popular television show, “Walking Dead,” saying he is an avid fan and hobbyist who displays the car and weaponry in shows. 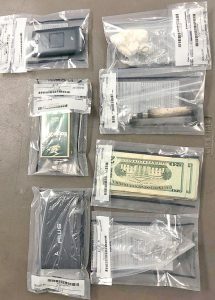 Those who supported the arrest, however, pointed out that police officers acted properly in arresting someone found on another’s property without permission in possession of potential weapons. Lockhart’s family members said after his hearing before Judge Melissa Byers Emmerling that his supporters were correct and that he had no ill intentions but was only scouting out the property at the request of a friend who is seeking background scenery for a calendar. “He likes ‘Walking Dead’ and he likes Mad Max movies and took it too far. He’s the type of kid who would help anybody,” according to his stepmother, Elissa Lockhart. His father, Matt Lockhart, said his son takes the vehicle to a lot of car shows and, in fact, won the sheriff’s award with it during one show. “He’s never been in any trouble with the law. Someone invited him to get some pictures for a calendar, and he was up there looking around. There are no signs up there posting it as private property,” Mr. Lockhart said. Detective Kevin Thompson agreed Lockhart did not give officers any trouble when they encountered him but said the incident could have ended up tragically. “What if we had come around the corner (inside the building) and found this large man standing there with a 14-inch knife in his hand?” Thompson said, indicating it could have ended up with Lockhart shot as has been the case in other nationwide incidents when officers encountered suspects with what appeared to be weapons. Addressing those who suggested on social media it was legal for Lockhart to have the pistol in his car because he has a concealed carry permit, Thompson said that is not the case. “He said he kept meaning to go get it, but he didn’t,” saying Lockhart has no such license to carry a concealed weapon. In court, Lockhart sat quietly alongside public defender Stacie Alejars as she asked for a continuance of the case to allow for the process of discovery, which was granted by the judge. Byers Emmerling, however, denied a motion by Alejars to modify Lockhart’s $10,000 cash/surety bond to a recognizance bond, citing the “serious circumstances” of his charges which she pointed out involved a loaded weapon on city property, and she continued the cash/surety bond. 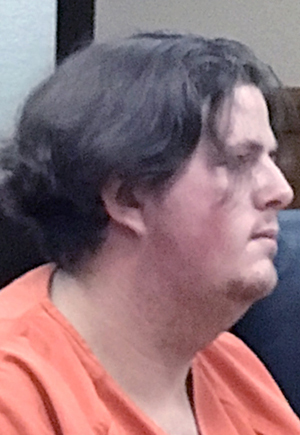 Also continued by the judge were terms of the bond prohibiting Lockhart from being on the Riverview property or possessing guns, ammunition or weapons, with Byers Emmerling emphasizing she meant “no weapons at all,” including baseball bats and knives. A second pretrial was scheduled for 9 a.m. Nov. 15.